Hosts Sharon and John Corbett. Introducing your hosts Sharon and John Corbett. We are both privileged and excited to be the owners of The Boutique Bed and Breakfast “ACCENT HOUSE” in beautiful Mapua. Having now completed our second season of ownership, a real thrill for us was winning ‘The Emerging B & B Business of the Year’ award for 2018 at the recent B & B Conference held at Lake Taupo. We look forward to welcoming guests to Accent House which is set in an acre and a half of park like native landscaped gardens. Sharon’s previous career was in the banking industry culminating in the role recently retired from of Senior Financial Adviser. In this role Sharon managed a broad range of portfolios for a number of clients, always aiming to ensure the best possible client experience. This included providing accurate and timely advice in a professional but caring way. Having travelled in New Zealand and extensively overseas, Sharon has a genuine passion for people from all walks of life. These experiences have given Sharon a good understanding of the excellent standards hospitality demands and brings these requirements to share with all guests who come to enjoy Accent House. Another passion is property and why she has studied and holds a diploma in Interior Design. John owns and operates other businesses which have seen him travel extensively domestically and abroad. Experiencing many different cultures around the world has given John a great understanding of business people and friends of many nationalities in their many different locations and circumstances. His travels have given him one of lifes greatest lessons – the safe knowledge that New Zealand is a gem in the global jungle. When overseas tourists hear about the wonderful country we are most fortunate to call home and then take the time and cost to come and visit, these travellers deserve a genuine warm welcome. Sharon and John are both certified 1st Aiders. Oscar, the 12 year old rough coated Jack Russell completes the family. He is not supposed to be in the guest area but will take all the attention given outside in the grounds! 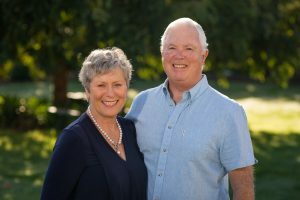 Both Sharon and John look forward to sharing their beautiful home and grounds and welcoming guests to a relaxing stay at ACCENT HOUSE along with all the exciting visitor attractions that Mapua and the surrounding districts offer in abundance. We will be operating year round so think about those winter breaks as well as summer ones!